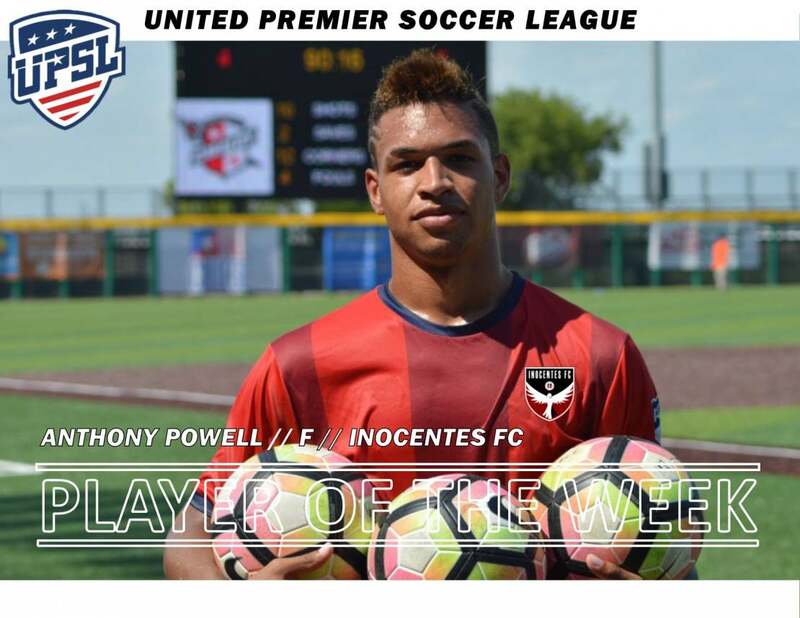 LOS ANGELES - Aug. 2, 2018 - PRLog -- Inocentes FC forward Anthony Powell has been named UPSL National Player of the Week. A native of Northfield (Minn.), Powell scored three times in a 3-2 victory over Dallas Elite FC in the UPSL Pro Premier Central Conference Championship Game on Saturday, July 28, 2018. Powell started and played 90 minutes for unbeaten Inocentes FC (6-0-4 overall), which advances to the UPSL 2018 Spring National Finals in Colorado with the victory. A graduate of Keller (Tex. )'s Fossil Ridge High School, Powell played at Cleburne (Tex. )'s Hill College and for a number of amateur clubs in the Dallas area including time in FC Dallas (MLS) Academy. The UPSL National Player of the Week is selected each week of the regular season by members of the league and journalists covering the UPSL. The UPSL was formed in 2011 and currently includes more than 200 teams in Alaska, Arizona, California, Colorado, Florida, Georgia, Idaho, Illinois, Indiana, Iowa, Kansas, Maryland, Massachusetts, Michigan, Minnesota, Missouri, Nebraska, Nevada, New Hampshire, New Jersey, New Mexico, New York, North Carolina, Ohio, Oklahoma, Oregon, Pennsylvania, Rhode Island, South Carolina, South Dakota, Texas, Utah, Virginia and Wisconsin. UPSL is the fastest growing Pro Development League in the USA, with 300-plus teams targeted for 2018 Spring Season. Each UPSL team is individually owned and operated, and is responsible for maintaining either UPSL Pro Premier Division or Championship Division minimum standards.